Diterpenoids are the main components of the byproducts discharged from sugi wood-drying process (BWP), making BWP a source of these useful compounds. Since there is no method for purifying these compounds from BWP, we sought to develop one. 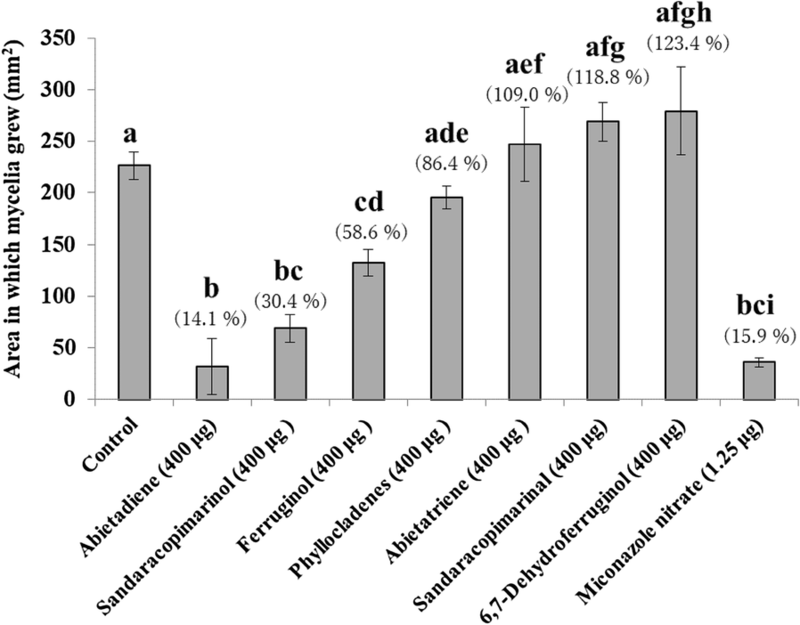 In this study, seven diterpenoids compounds were isolated: abietatriene (I), phyllocladenes (II-i and II-ii; a complex of isophyllocladene and phyllocladene), abietadiene (III), sandaracopimarinal (IV), 6,7-dehydroferruginol (V), ferruginol (VI), and sandaracopimarinol (VII) using medium-pressure liquid chromatography (MPLC) and high-performance liquid chromatography (HPLC). We tested the biological activities of these diterpenoids. Compounds V and VI showed antioxidant activity in the DPPH radical scavenging method, β-carotene bleaching method, and linoleic acid method. 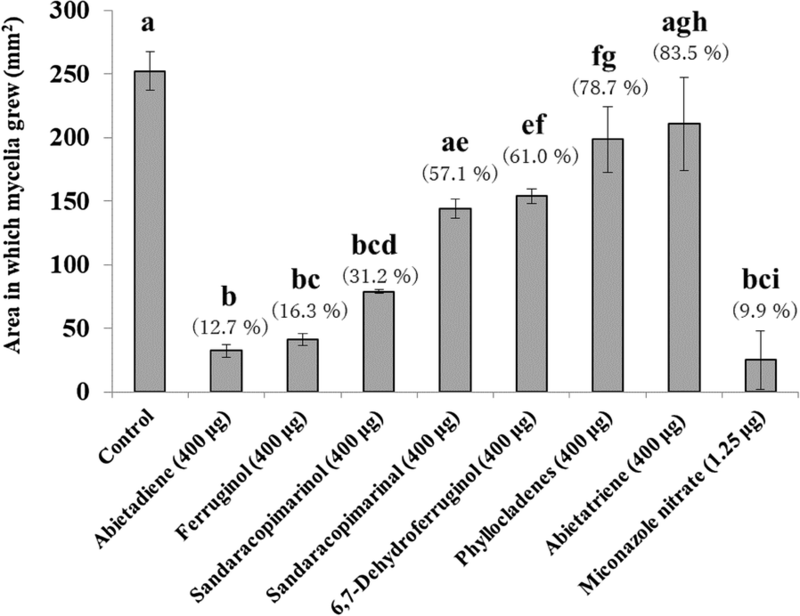 Furthermore, compounds V–VII showed antimicrobial activity against Propionibacterium acnes, and III, VI, and VII showed antifungal activity against Trichophyton mentagrophytes and Trichophyton rubrum. These results contribute to the accumulation of knowledge on diterpenoids and will help in developing new ways of utilizing BWP, a currently unused woody biomass. Recently, due to environmental protection efforts in Southeast Asia and changes in the price of wood on the world market, domestic conifer woods have become the main materials for plywood veneer sheets in the Japanese wood industry, replacing imported lumber such as lauan. In plywood factories, green veneer sheets are dried in a boiler at around 170 °C. Because the exhaust steam from the drying process contains a large amount of volatile organic compounds, it is collected by cooling to avoid its release outdoors. After collecting this exhaust steam, a viscous tar-like sediment is also collected, especially from conifer woods like Cryptomeria japonica (sugi), which has a rich resin. Ohira reported that 50 tons of sediment discharged during the drying process is collected per year . Therefore, development of a way to utilize these byproducts is urgently needed. Our previous studies demonstrated that the main components of the byproducts discharged from sugi wood-drying process (BWP) are diterpenoids, such as ferruginol and sandaracopimarinol , and it could remove nitrogen dioxide when they come into contact with nitrogen dioxide gas . BWP also exhibited the antimicrobial activity . We also analyzed the composition of the main diterpene components , which in order of abundance were sandaracopimarinol, ferruginol, 6,7-dehydroferruginol, abietadiene, and sandaracopimarinal. 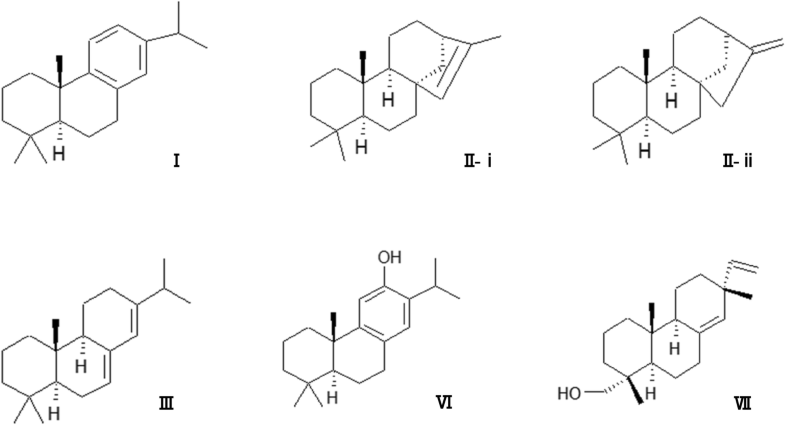 These diterpene compounds have many known bioactivities. For example, sandaracopimarinol has antimicrobial activity  and termiticidal activity . 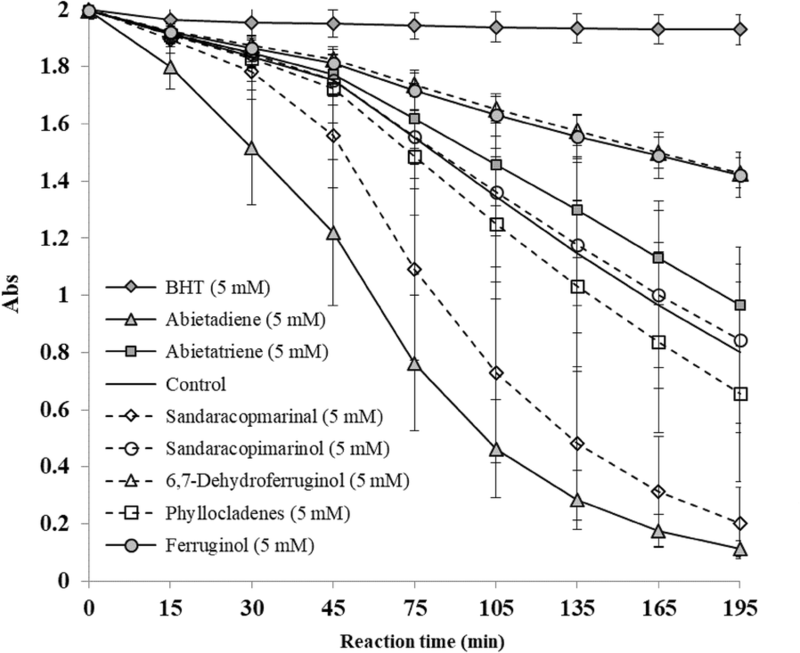 Ferruginol has antimicrobial activity [4, 6], antioxidant activity , gastroprotective and ulcer healing effects , termite resistance effects , and growth inhibition activity against Heterosigma akashiwo . 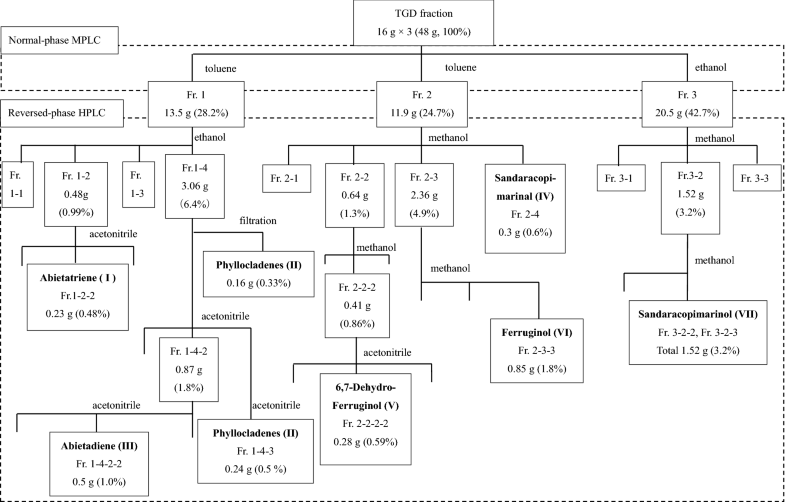 Moreover, there is a combined inhibitory effect of sandaracopimarinol and ferruginol on shiitake (Lentinula edodes) mycelial growth . 6,7-Dehydroferruginol, which is a derivative of ferruginol, also shows antimicrobial activity . Abietadiene can remove nitrogen dioxide upon contact with nitrogen dioxide gas  and affects human electroencephalograms when the subjects smelled the compound that dissolved in ethanol by a filter paper . Thus, since BWP is a source of useful compounds, the aims of this study were to accumulate knowledge about the functions of these terpenoids that will help in developing new ways of utilizing BWP and to give them added value. In this study, seven diterpenoids compounds were isolated from BWP: abietatriene (I), phyllocladenes (phyllocladane (II-i) and isophyllocladene (II-ii)), abietadiene (III), sandaracopimarinal (IV), 6,7-dehydroferruginol (V), ferruginol (VI), and sandaracopimarinol (VII). In our previous report , these compounds in BWP are already identified. Then, we examined their antioxidant, antibacterial and antifungal activities to estimate the practical availability. Particularly, the application as the antioxidant for lipid and the therapeutic drug for skin diseases was discussed in this study. Propionibacterium acnes (NBRC 107605), Trichophyton mentagrophytes (NBRC 6174), and Trichophyton rubrum (NBRC 5467) were ordered from the National Institute of Technology and Evaluation (NITE, Kisarazu, Japan). Culture conditions are described below. Palladium-activated carbon (10% Pd–C), Wakogel C-300HG, butylated hydroxytoluene (BHT), linoleic acid, Tween 40, β-carotene, methyl linoleate, and miconazole nitrate were obtained from Wako Pure Chemical Industries., Ltd. (Osaka, Japan). Cellulose powder was obtained from Toyo Roshi Kaisha., Ltd. (Tokyo, Japan). Chloroform-d [99.8% atom% D, containing 0.03% (v/v) TMS] was obtained from Sigma-Aldrich (Tokyo, Japan). 1,1-Diphenyl-2-picrylhydrazyl was obtained from Tokyo Chemical Industry Co., Ltd. (Tokyo, Japan). GAM broth was obtained from Nissui Pharmaceutical Co., Ltd. (Tokyo, Japan). Benzalkonium chloride was obtained from MP Biomedicals, LLC (Santa Ana, CA, USA). Peptone was obtained from Nihon Pharmaceutical Co., Ltd. (Tokyo, Japan). BWP was distilled by solvent-assisted distillation (SAD) using a method developed in our previous research  to obtain a water distillate (WD) fraction and a triethylene glycol distillate (TGD) fraction. Then, the TGD fraction was separated by medium-pressure liquid chromatography (MPLC) and high-performance liquid chromatography (HPLC) as shown in Fig. 1. The TGD fraction was separated into three fractions by MPLC using a normal phase column (Sepacore Silica, 220 g, BÜCHI, Germany). Toluene was used as a first mobile phase for collecting Fraction 1 and Fraction 2. Then, the mobile phase was changed to ethanol for collecting Fraction 3. The chromatogram was checked by RI Monitor RI-10 (EYELA, Tokyo, Japan), Ceramic Pump VSP-3050 (EYELA) was equipped with this fractionation system. Each collected fraction was evaporated and weighed by drying under reduced pressure. The quantitative analysis was done by gas chromatography with flame ionization detection (GC-FID), and the chemical composition of each collected fraction was confirmed by gas chromatography–mass spectrometry (GC–MS). The analysis conditions of GC-FID and GC–MS are written in the later passage. Based on GC-FID and GC–MS analyses, compounds I, II-i, II-ii, and III were contained in Fr. 1; compounds IV, V and VI were in Fr. 2; and compound VII was in Fr. 3. The eluted fractions were further fractionated by HPLC using a reversed-phase column (Inertsil ODS-3 20 mm i.d. ×250 mm, GL Science, Tokyo, Japan), a Shimadzu Liquid Chromatograph LC-6AD pump (Shimadzu, Kyoto, Japan), and a Shodex RI-72 (Showa Denko K.K., Tokyo, Japan) or Shimadzu SPD-20A (UV) detector (Shimadzu). The isolation scheme of diterpenoids from TGD fraction is shown in Fig. 1. The collected fractions were evaporated and dried under reduced pressure. Then, the yield of each compound (based on the TGD fraction) was calculated as I (0.48%), II-i and II-ii (0.33%), III (1.0%), IV (0.6%), V (0.59%), VI (1.8%), and VII (3.2%). The analysis and confirmation of the chemical composition of each purified fraction were carried out by GC-FID and GC–MS using an HP-5 column. Finally, 1H and 13C NMR were used for identification of the isolated diterpenoids. Because there are no detailed data about NMR analysis for IV and V in literature, we confirmed the structure of IV and V by reduction; IV and V was changed to VII and VI, respectively. The condition of each reaction was written in the following passage. Isolated compound IV (27.4 mg) was dissolved in methanol, then NaBH4 was added gradually (total amount of NaBH4, 611.4 mg). After the reaction, the solution (methanol; 20 ml) was mixed with n-hexane (50 ml) and purified water (30 ml), and then the organic phase was collected. The organic phase was dried under reduced pressure. The quantity collected was 20.9 mg, and the yield was 76.3%. According to our previous report , isolated compound V (35.0 mg) was dissolved in ethyl acetate and 10% Pd–C (14.0 mg) was added. The gas phase used in this study was H2, and the reaction was done under room temperature. The reaction product was filtered under reduced pressure using a separation funnel containing cellulose powder (40–100 mesh) and Wakogel C-300HG (40–60 μm). Then, the filtrate was concentrated and dried under reduced pressure. The quantity collected was 30.9 mg, and the yield was 88.3%. Each diterpenoid sample was dissolved in ethanol at a concentration of 10 mM. BHT was used as a positive control. A 0.2 ml aliquot of sample solution, 1.0 ml 0.2 M DPPH, 0.2 ml 0.1 M Tris–HCl (pH 7.4), and 0.6 ml ethanol were mixed in a screw-cap tube. The tubes were shaken and the contents allowed to react at room temperature in the dark. After 30 min, the absorbance was measured at 517 nm by a UV mini-1240 spectrophotometer (Shimadzu, Japan). 60 μl of each sample solution (5 mM in dichloromethane) or dichloromethane (control), and 2940 μl of an emulsion of linoleic acid, β-carotene and Tween 40 in sodium phosphate buffer (pH 6.8) were collected in an opaque screw-cap tube and mixed well. Each sample was then incubated at 50 °C, and the absorbance measured at 470 nm by a UV-mini 1240 spectrophotometer after 0, 15, 30, 45, 75, 105, 135, 165, and 195 min. 150 μl methyl linoleate solution (0.05 mM in ethyl acetate) and 100 μl of each sample (1 × 10−3 mM; 2% mol equivalent weight of methyl linoleate) were mixed in a 4 ml vial. After removing ethyl acetate, the vials were heated at 85 °C in an oven. Heating time was set to 0, 6, 12, and 24 h. After heating, the vials were cooled in a desiccator. Then, 1.2 ml ethyl acetate was poured into each vial. Samples were analyzed by GC-FID to calculate the residual rate of methyl linoleate by the internal standard method using heptadecane as internal standard. 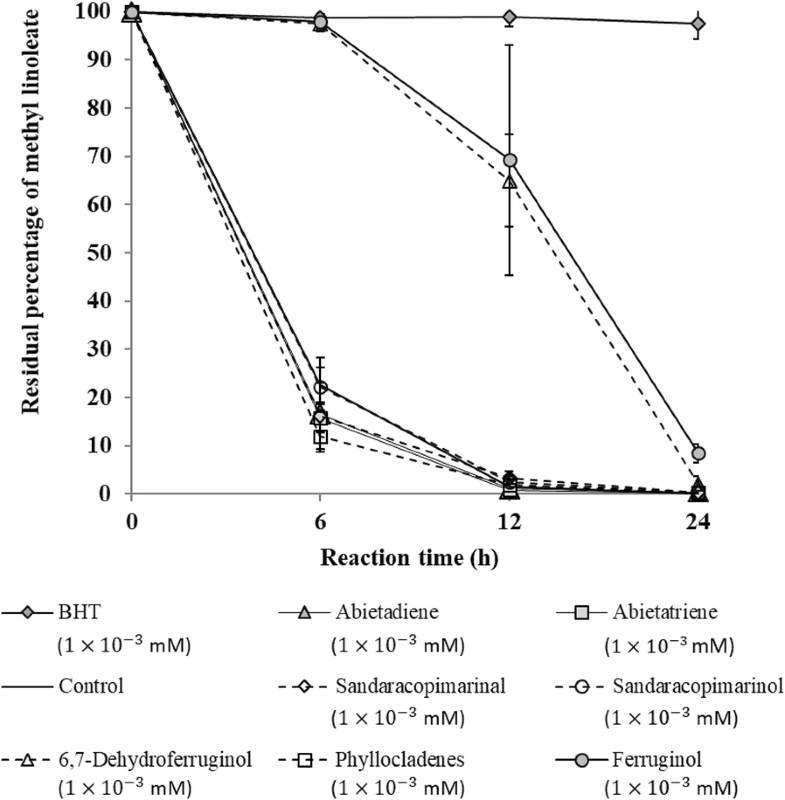 The minimal inhibitory concentration (MIC) and minimal bactericidal concentration (MBC) values were determined for P. acnes (NBRC 107605). P. acnes was pre-incubated in GAM liquid medium (pH 7.3) at 37 °C for 72 h under anaerobic conditions. The number of bacteria was counted by the McFarland turbidimetry method; turbidity corresponded to the No. 5 standard test tube (15 × 108/ml) . Isolated diterpenoids were dissolved in ethanol, and twofold serial dilutions of each sample from 5 mg/ml were prepared. Benzalkonium chloride was used as a positive control, and the solution was prepared in the same manner as the isolated terpenoids. To a 50 μl aliquot of each sample solution, 10 ml GAM liquid medium was added in a screw-cap test tube and mixed well. The final concentrations of purified diterpenoids and benzalkonium chloride were twofold serial dilutions from 25 μg/ml. Then, inoculum was added to each screw-cap test tube (n = 3), and the tubes were incubated at 37 °C for 72 h under anaerobic conditions. The concentrations showing no visually detectable bacterial growth were determined to be the MIC value. A 1 ml aliquot of the culture medium collected from test tubes with no visually detectable bacterial growth was inoculated in 10 ml of fresh GAM liquid medium. As done for MIC, the concentration at which there was no bacterial growth after incubation was determined to be the MBC. Trichophyton mentagrophytes (NBRC 6174) and T. rubrum (NBRC 5467) were pre-incubated in Sabouraud agar medium (pH 6.0) at 25 °C for about 2 weeks. The concentration of isolated diterpenoids was adjusted to 4 mg/ml by acetone. Miconazole nitrate (positive control) was prepared twofold serial dilutions from 50 to 3.13 μg/ml. Then, 2 ml molten Sabouraud agar medium was poured into a sterilized Petri dish (35 mm diameter, Falcon), and 100 μl of sample solution was spread on the surface of the medium, for a final concentration of each isolated diterpenoid of 400 μg, with the miconazole nitrate concentration ranging from 5 to 0.313 μg. After removing acetone by air-drying, the agar blocks with hyphae on the surface were punched out by a cork borer (5 mm in diameter), and then placed in the center of Petri dishes. The Petri dishes were incubated at 25 °C for 10 days. The average diameter of hyphae for three test specimens was measured by a caliper, and the area in which mycelia grew (mm2) was calculated to evaluate the antifungal activity of test samples. GC-FID was performed on a 7890B GC System (Agilent Technologies, Santa Clara, CA, USA) equipped with an HP-5 column (30 m × 0.25 mm i.d., 0.25 μm film thickness, Agilent Technologies). The oven temperature started at 60 °C and increased at 3.0 °C/min to at 240 °C. The temperature of both the injector and the detector was 250 °C. Flame ionization was used for detection. The volume of injected sample was 1 μl, and the split ratio was 1:4. The carrier gas was N2 and the flow rate was 1.3 ml/min. When we analyzed the mixture, 0.2 mg of heptadecane was added for 10 mg of sample. On the other hand, when pure substance or a few yield samples were analyzed, 1 mg of heptadecane was added to 1 mg of sample. The total volume was adjusted to 1 ml using n-hexane or ethyl acetate. The conditions for the linoleic acid method were an initial oven temperature of 180 °C, which was increased at 10 °C/min to at 280 °C. The temperature of both the injector and detector was 280 °C. Other parameters were the same as above. GC–MS was performed on a GCMS-QP2010 instrument (Shimadzu) equipped with an HP-5 column. The initial oven temperature was at 60 °C, which increased at 3.0 °C/min to 240 °C. The injector and the detector temperatures were both 250 °C. The injected sample volume was 1 μl and split rate was 1:40. The carrier gas was He and the flow rate was 1.61 ml/min. Electron ionization was used and the mass range was from 40 to 500 m/z. Mass spectra were taken at 70 eV and the ion source temperature was 250 °C. The GC–MS samples were prepared using the same procedure used for GC-FID. NMR spectra (1H: 400 MHz, 13C: 100 MHz) were recorded on a JEOL AL400 FT-NMR spectrometer. Each purified diterpenoid (50 mg) was dissolved in 0.7 ml chloroform-d. The experimentally measured spectra were compared with data from the literature [6, 19, 20, 21, 22, 23]. All biological activity tests were performed in triplicate. The results were evaluated by a Tukey–Kramer test, and were expressed as mean ± standard deviation (SD) for each measurement. The p values were set at < 0.05. Statcel 3 (4 Steps Excel-Statistics, OMS Publishing Ltd, Saitama, Japan) was used as statistical software. From the TGD fraction, seven diterpenoids compounds were isolated by MPLC, and HPLC. We could purify these diterpenoids more easily from the BWP than the plant materials such as wood, branches and leaves, because the content rate of diterpenoids of BWP was higher than that of the plant materials. 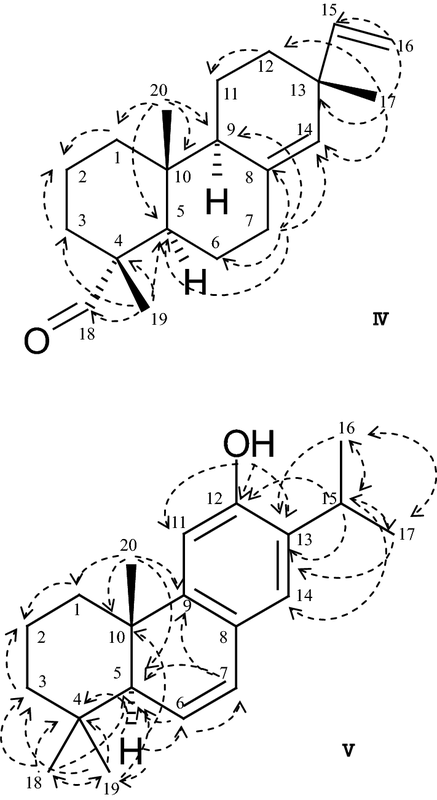 Furthermore, these diterpenoids were fractionated in the TGD fraction from BWP by SAD. The yield of each fraction was based on the TGD fraction (48 g). The structure and purity of each terpenoid were confirmed by NMR. However, there were no NMR data that the 13C signals have been assigned for IV or V in published reports. Thus, the isolated samples were reduced to form VII and VI, and then identified by 1H and 13C NMR analyses. We also obtained the DEPT, HMBC and HMQC data of IV and V, and assigned the 13C NMR signals based on these data. The chemical shifts of the diterpenoids are in Tables 1 and 2, and the structures of the diterpenoids purified from the TGD fraction are shown in Figs. 2 and 3. These major components of the TGD fraction were all known compounds. In this study, the 13C NMR signals of IV and V were assigned for the first time. To investigate the antioxidant activities of the purified terpenoids, three assays, a DPPH radical scavenging assay, a β-carotene bleaching assay and the linoleic acid method, were adopted. BHT was used as the positive control. The results are shown in Fig. 4. The activity of VI was 69.6%. It has already been reported that VI has a radical capturing function . Also, it has been reported that VI showed 53% of inhibition ratio at 100 μg/ml, but the activity of VII was less than 10% at 100 μg/ml in DPPH radical scavenging activity assay . Our results supported this knowledge. The activity of V was 87.6% (10 mM), which was comparable of the activity of BHT (88.8%, 10 mM). Moreover, though there were no previous data in the literature about the DPPH radical scavenging activity of V, it was stronger than that of VI. However, the other terpenoids did not show any DPPH radical scavenging activity. The results are shown in Fig. 5. After 195 min of reaction, BHT (5 mM) maintained high antioxidant activity, inhibiting the bleaching of β-carotene. Compared with BHT, VI and V (at 5 mM) showed weak antioxidant activity, with the degree of activity of VI and V almost equal. Other purified terpenoids did not show antioxidant activity. Our results supported those of a previous study , in which VI showed antioxidant activity based on a β-carotene bleaching assay. The results are shown in Fig. 6. After 24 h of heating, BHT maintained high antioxidant activity. Among the purified terpenoids, VI and V had antioxidant activity. After 6 h of heating, both compounds showed the same activity as BHT. However, their activity weakened slowly, and the amount of methyl linoleate almost disappeared after 24 h of heating. It may be that the chemical composition of these terpenoids was changed by heating . The relationship between the change in chemical composition and antioxidant activity is not clear; so detailed investigations should be carried out. Other purified terpenoids showed the same tendency as the negative control; so we could not confirm antioxidant activities. VI and V showed antioxidant activity in every assay. There are literature data for evaluating the bioactivities of 11 essential oils . 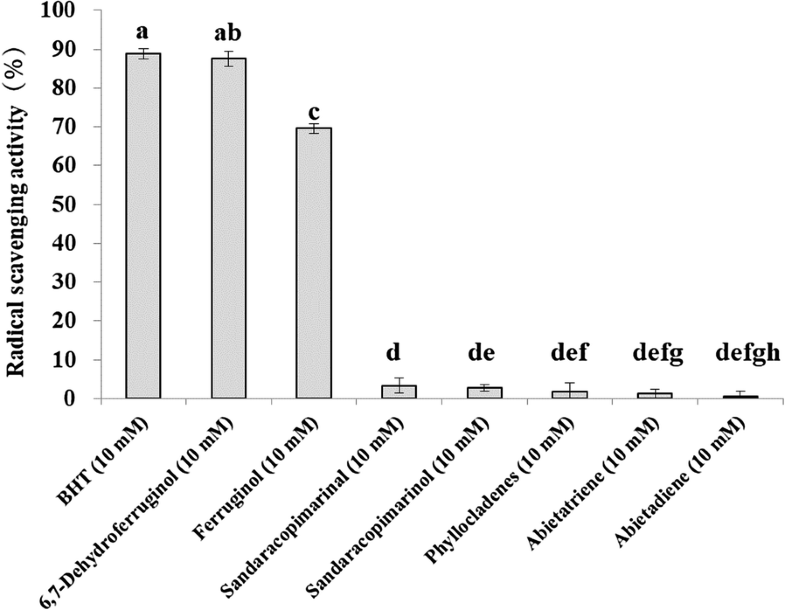 Based on these results, Thymus vulgaris essential oil, thymol chemotype, shows the highest activities in the DPPH assay and β-carotene bleaching test. The substructures of VI and V are common to the structure of thymol. We currently consider that the key to their activity is their structure. In commercial use of terpenoids, mixing them with an ointment is better than a water-based solution like skin lotion because they are hydrophobic compounds. Data are, therefore, needed on how diterpenoids affect microbes that cause skin diseases. Thus, we chose P. acnes, T. mentagrophytes and T. rubrum as the test microorganisms because they are epidermal bacteria. The results are shown in Table 3. The antimicrobial activity against P. acnes was evaluated by MIC and MBC values. Benzalkonium chloride was adopted as a positive control. VI, V and VII showed antimicrobial activities based on both MIC and MBC. 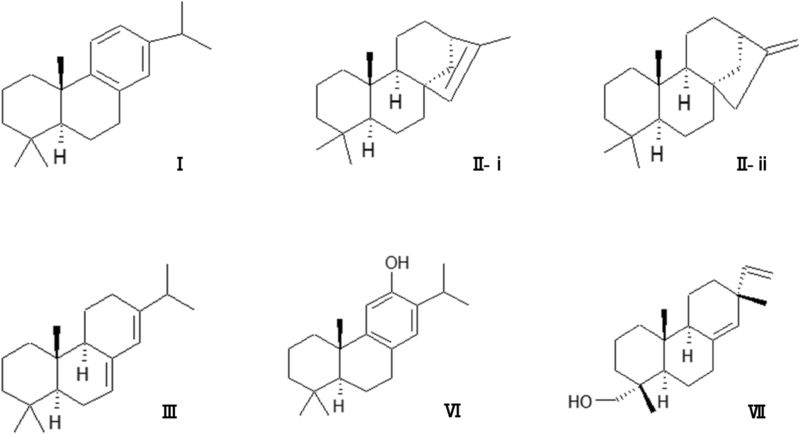 VI exhibited the strongest activity of the purified terpenoids, and the activity of V, an analog of VI, was the next strongest. VII exhibited the third strongest activity, but IV, an analog of VII, had no detectable MBC value. There is interest in a patent for treatment of acne that uses the essential oil or the epi-cubenol and isopropylmethylphenol collected from Japanese cedar wood or barrels . Though the method was not the same as ours, there is, thus, a possibility that terpenoids originating from C. japonica may be useful in the treatment of acne. P. acnes are anaerobic Gram-positive bacteria. In previous study, ferruginol showed antimicrobial activity toward Gram-positive bacteria . However, the MBC value of the other purified terpenoids (I, II, III, IV) could not be detected. Trichophyton mentagrophytes and T. rubrum were used in this test. The results are shown in Figs. 7 and 8. III, VII, and VI inhibited the fungal growth. Compound III showed the highest growth inhibition, which was stronger than that of oxygen-containing diterpenoids like VI and VII. Interestingly, abietatriene (I) did not show any inhibition, though its structure is similar to that of III: both I and III are hydrocarbon abietane-type diterpene, the A ring structure is common. And V, an analog of VI, and IV, an analog of VII, showed no activity too. Generally, III showed weak bioactivity, such as antimicrobial activity. 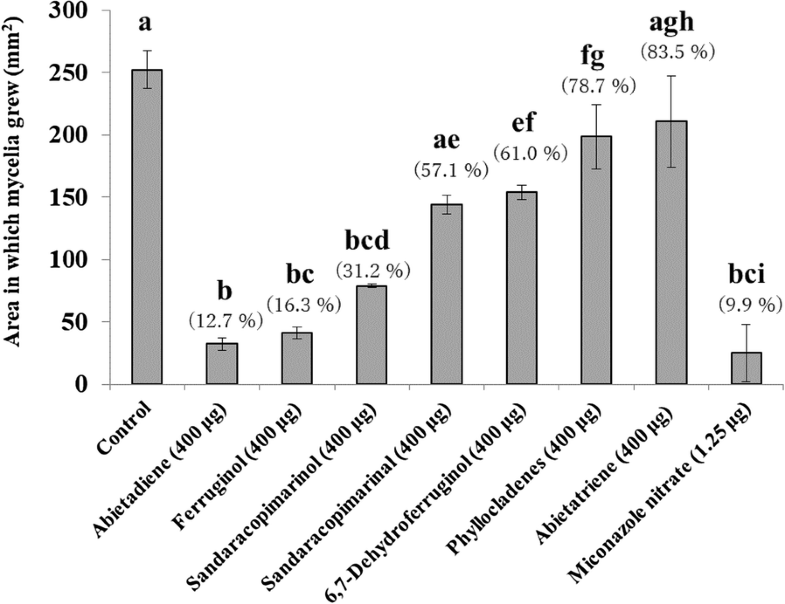 It was considered that the degree of volatility and the difference in permeability of these compounds in agar medium affected the growth of Trichophyton species. A previous study reported that essential oils have anti-Trichophyton activity, and it was found that essential oils show antimicrobial activity according to a process: first they volatilize and diffuse in the air, and then they are absorbed by the agar medium . In that study , the essential oil compounds that were used as experimental materials were mainly monoterpenoids and sesquiterpenoids. The behavior of diterpenoids was not the same as that of monoterpenoids or sesquiterpenoids, but it could be that the volatility of compounds affects their antimicrobial activity. Also, it was considered that the structure of diterpenoids could have been modified over the 10-day incubation term. In any case, the reason for changes in activity over time was not clear; so we would like to consider this subject for future analysis. Seven diterpenoids compounds were isolated: I, II, III, IV, V, VI, and VII, from the TGD fraction collected by SAD using BWP as the raw material. We also tried to measure several kinds of assays to investigate each potency of purified diterpenoids. From these results, V and VI were showed antioxidant activity using the three antioxidant assays. Then, VI, V, and VII showed antimicrobial activity to P. acnes. And III, VI, and VII showed growth inhibition activity toward T. mentagrophytes and T. rubrum. These results indicate the potentials of the diterpenoids as the antioxidant for lipid and the therapeutic drug for skin diseases. This study has contributed to accumulation of knowledge about diterpenoids derived from C. japonica and to expansion of the possibilities for development of the practical uses for BWP. HK designed and integrated this study. MG, Minori Tsuji and YY performed the purification of diterpenoids and each NMR analysis. Maiko Tsujimura performed the purification and the assays for biological activities, collated these results. TA gave the accurate advices for handling and evaluating about terpenoids. KK gave the accurate advices for the assays that we tried in this study. TO have carried out the previous study about sugi wood-drying byproducts, and contributed in the purification of terpenoids as well as the assays for biological activities. Maiko Tsujimura prepared and revised the manuscript. All authors read and approved the final manuscript. We are very grateful to Associate prof. Koji Harashina, Faculty of Agriculture, Iwate University, for giving advice on statistical analysis. 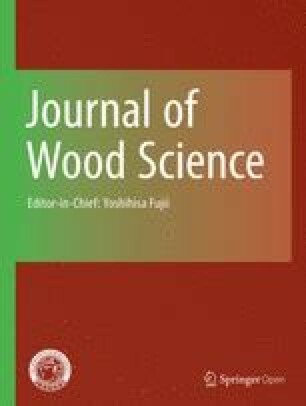 This study was presented at the 67th Annual Meeting of the Japan Wood Research Society, Nagoya, Japan, March, 27–29, 2016.